I’ve mentioned before that I’m not much of a “pretty dessert” maker. I lack the patience for intricate detail work or even for frosting a cake. When I make cupcakes, they are the ones without all the pretty frosting and such. I’m all about simple. My latest simple cupcake comes from one of my favorite magazines, Southern Living. These little treats don’t really fall into the traditional cupcake category. The batter is much more like cookie dough than cake batter. Its consistency is much more toward scooping than pouring. The flavor of the “cupcake” portion is reminiscent of a blondie. 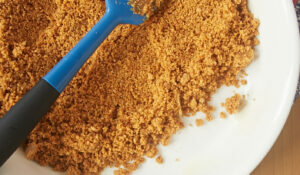 All that brown sugar is just wonderful. Then, that is topped with a chocolate and pecan combination that really pushes them over the edge to near perfection. There’s quite a bit of punch in these little guys. Of course, it may be hard for you to stop with just one. 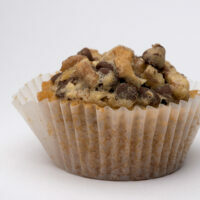 Chocolate Chip Cupcakes are a great cupcake-cookie hybrid! Preheat oven to 350°F. Line 36 cups of miniature muffin pans and coat with cooking spray. Using an electric mixer on medium speed, beat the butter and both sugars until creamy. Add the vanilla extract and mix well. Add the egg and beat until blended. In a separate bowl, combine the flour, baking soda, and salt. Add to the butter mixture, mixing just until combined. Spoon about 1 & 1/2 teaspoons of the batter into each muffin cup. Bake for 10-12 minutes. Using an electric mixer on medium speed, beat the brown sugar, egg, and salt until blended. Stir in the chocolate chips, pecans, and vanilla. After the cupcakes have been baked, spoon the topping mixture over each cupcake. Bake for 8-10 more minutes. 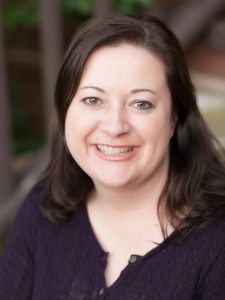 OMG – your blog is heavenly!!! And I’m not a “sweets” kind of gal! Man oh man do these cupcakes look delish???!!!?? ooh chocolate and pecans scream your name! I too can’t stand overly fussy desserts and cakes. Who has time and energy to spend decorating cakes for hours when they don’t even taste that good?! I’d rather blow someone away with the taste and flavor than the outside look. These look delicious! Pecans and chocolate are a great flavor combination! I used to grow up with a mom who always liked baking things easy and fast. Maybe it’s living in Austria too, where we don’t usually have things like three-layer-cakes or cupcakes. But I totally understand what you mean by being all about simple – I love it too. Reading books with american treats is a total new experience for me, but I’m still the good ole Austrian girl loving the simple things. These cupcakes are wonderful. I believe their taste is amazing! Those look fabulous – chocolate cookie and cupcake mixed into one – what could be better? Oh my. As always… another recipe going straight to my “to make immediately” list. These look and sound amazing! I am not the biggest fan of icing, since it’s usually rot-your-teeth sweet, so these are my kind of cupcakes! OH. MY.GOSH. Those look so good! I will be trying those this weekend! How cute. Im not a fan of icing either, but I have learned that piping bag with a simple tip can be your savior in faking people out that you can ice a cake. Yum! 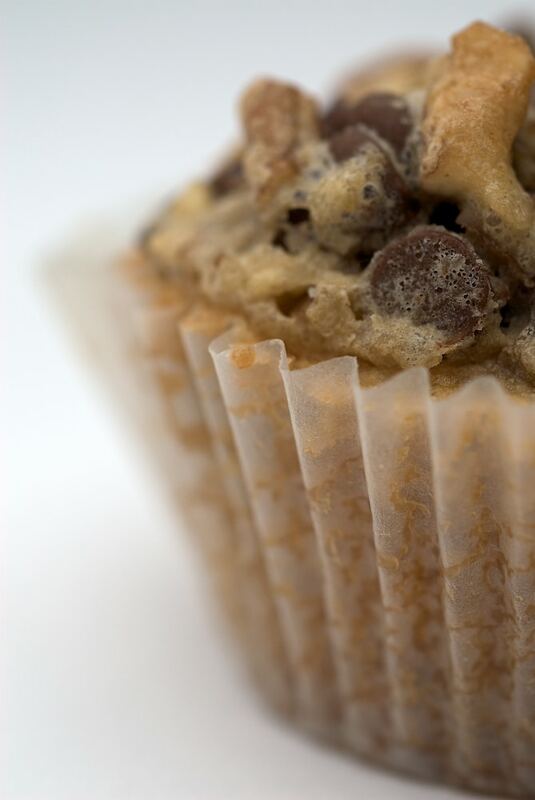 You never cease to amaze….CCC’s are my weakness and in cups, how cute. Oh yummy..I bet the crunchy topping made these to die for! 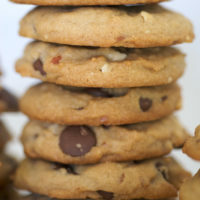 What a great twist on a classic cookie. Looks delicious!! YUM!! I love blondies and obviously I love cupcakes. Sounds awesome! Well, these look absolutely gorgeous! Yum! 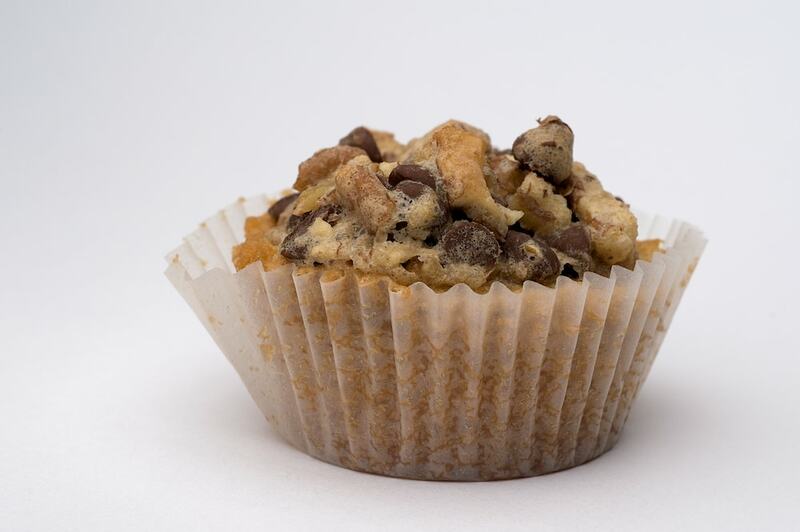 It is like a cookie dough baked in mini muffin tins topped with a sugary mixture from heaven!! I wonder how PB would be mixed into the cupcake batter? HMMMM. I may have to play around! You are right…stopping after eating one will be a problem…but a delicious problem! Outstanding cupcakes, I could probably scarf one or two down. I agree about the fancy toppings, and personally I find most frosting too sweet, to the point where you can’t taste the cupcake itself and it almost hurts your teeth. 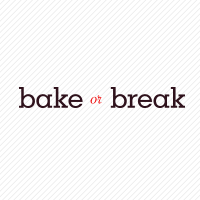 i saw this post on tastespotting and had to come over and check it out! these look so delicious, sure to satisfy more chocolate cravings! Jennifer, I think you are great just the way you are. Though fancy is good, I come by for your comfort food and wholesome baking. You always leave me satisfied and full (well almost as you get to eat your food and I get to dream about eating it). Nick, I have that same aversion to overly sweet frostings. Those traditional birthday cakes are just too much! Oh you… you’re definitely a pretty dessert maker. Funny… I made cookie cupcakes recently too. I do have to say that it was quite difficult to get a nice, pretty picture of it since it wasn’t all that exciting looking. You managed to do it though! Can I just say that it is pure torture that I found this website while I’m sitting here with gestational diabetes. 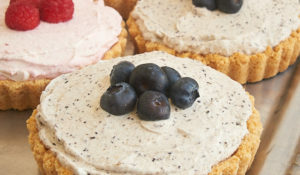 I have about 5 weeks to go, then I’m going to be baking like a wild woman….starting with these cupcakes! OMG! At the risk of being labeled a heretic I will proclaim that I love blondies more than brownies. So this delicious delight will be added to my recipe binder. The weather has cooled in this neck of the woods. Ovens can be preheated without the danger of swooning. Blueberry muffins were made last weekend to much acclaim. I just took these out of oven. Taking to a housewarming party tomorrow night. These will outshine the hostess. Constance, I’ll take blondies or brownies. I’m not that picky. Enjoy oven season! Carole, I hope they’re a hit! oh you are definitely talented my dear. these look divine, such a good photo too. Made them, loved them although mine were definitely not as pretty as yours but they tasted SO GOOD! Thanks again! gingela5, I’m glad you liked them! I just stumbled across your blog, and I love it. You take such beautiful photographs! Mmmmmmmm….these look amazing! At first I thought they were just regular choco chip cupcakes, but then I read your description – oh yum! These are going on my “to-bake” list for sure! Your photos are outstanding. I wanted to eat the cupcake through the screen! Love it! Sarah, I hope you enjoy them! How I love your blog…every little post you make…it’s all so wonderful and beautiful and delicious. I’ve left you an award on my blog. Oh my dropping jaw…I think I’m in love with a cupcake. How is that even possible?! Those sound and look so good! Those look absolutely irresistable! Could the pecans be successfully omitted (nut allergy) or substituted with something else for an equally delicious treat? Absolutely, Justine. Substitute something else or just increase the amount of chocolate. Enjoy! Wow! 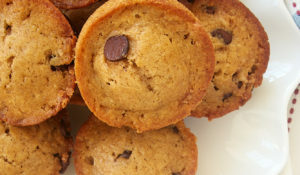 I was already excited when I saw the headline, Chocolate Chip Cupcakes, then I read that they also taste like blondies? I’m hooked! 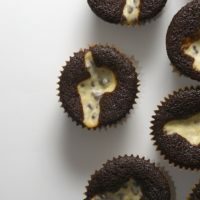 Although I posted on my blog that I was skeptical as a cupcake without frosting is like a turtle without his shell…I have to tell you that these were capital Y..Yummy! You have an amazing site! erin, they are the best of many worlds! Cara, I’m glad you liked them. Thanks! These cupcakes look out of this world, thanks for sharing!! YUM!!!!! I’m so making these! Thanks!!!! These look enticing! Very enticing! 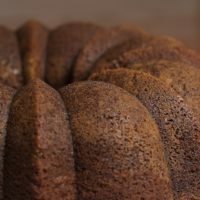 Thanks for sharing such amazing recipes and photos. I just love your website. I tried these cupcakes today, and although they taste quite yummy, they don’t look anything like yours. The base of the cupcake really puffed up but quickly fell, leaving a deep hole in the center (before I put the topping on). Also, I sprayed the paper liners with pam as directed, but they came out very greasy and gooey on their bottoms. I wondered if I should have pressed the dough into the liners instead of just dropping the dough in. Any advise for me so I can try them again? Thanks for any help you can give me!! Rachel, I just dropped the dough into the liners, so I’m not sure why that didn’t work. As for the other issues, maybe the batter was overmixed? lind, I’m sorry you’ve had troubles with these muffins. Maybe you over-mixed the batter? Oh My! these look so good! Just found you through Bakerella on twitter. These look delicious! Could they be made in a regular muffin tin instead of a mini? Jacqueline, I don’t see why you couldn’t use a regular muffin pan. Hello All! I made these the other day. I had the same problem as some of the posts. The first time I tried to make them, my batter only allowed 24 cupcakes. Wrong!! When I checked them, the batter had risen over the pan and onto the oven floor. I tried again. This time, I made sure I followed directions and made 36 cupcakes. I saw big holes, but filled them anyway and baked them to the end. They looked terrible, but tasted great! I am going to make them again right now, but this time, I am using baking powder. Jennifer is correct, we may be mixing ours too long. I used a mixer and I think she is right. However, here I go! I really want these to work out. I love the recipe and I love the taste. Ta dah!!! It worked!!! Instead of using baking soda, I used baking powder. They turned out perfect! Jennifer, I am making them again for a team meeting. My daughter loves them, too! Maybe baking powder should be used at lower elavations? They are beautiful!! Thanks for the recipe. I am curious if posters that had the big hold problem tried again using baking powder instead, if it would work for them. Thanks!! Hey All! I just baked these and they turned out very, very well! I used a mini muffin pan for the first time (they are SO cute) and I hand mixed the batter. I think this completely solves the previous problems. Also I followed the recipe exactly and didn’t use baking powder as Karen suggested and they still turned out pretty and YUMMY! These look amazing! I’ll have to give them a go. Love your site!!!!! 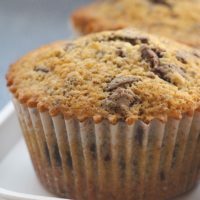 I stumbled across this recipe while looking around for cupcake ideas for my son’s 7th b.day party this weekend (he requested chocolate chip muffins or cupcakes). I don’t want to have to go and buy mini muffin pans. So, my question is this: If you were going to use standard size cupcake pans, about how high would you fill them (when getting ready to fill the cupcake part of the recipe) and about how long would you let them bake…or what should the cupcake part look like when it’s done? (ie: light golden brown, but springy…any tips will be VERY helpful!) Hopefully, I can eye it up from there and decide how much topping to put on each! Hi, Chris. I would try filling them about 2/3 full. You should have enough batter for about 18 standard size cupcakes, so you can use that as a basis to adjust a bit if necessary. You’ll probably need to increase the initial baking time by 5-8 minutes. 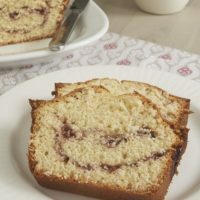 For the second round of baking after the topping has been added, you probably won’t need to increase the time, but you may have to make that decision as you’re baking them. Good luck! And happy birthday to your son! This is exactly what I’ve been looking for! 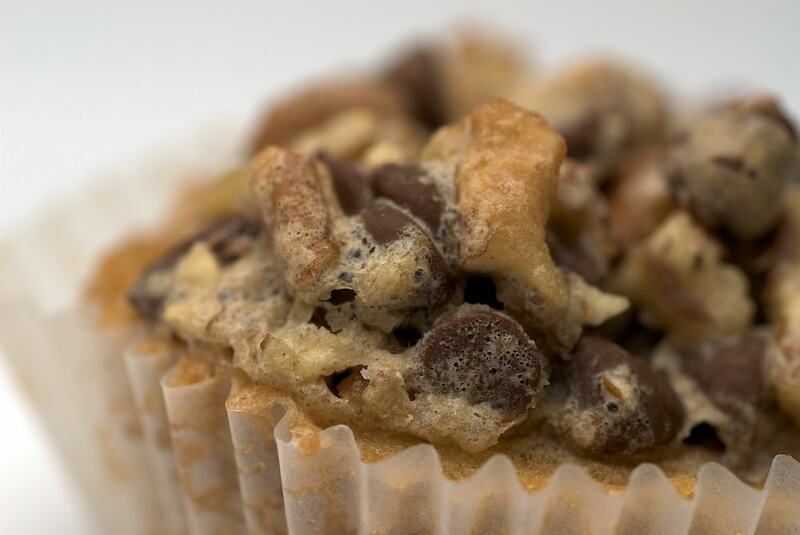 A chocolate chip cupcake that has the texture of a chocolate chip cookie! Thank you!